ANAHEIM, Calif. (AP) — On his first shift of the playoffs, James Neal pounced on an unattended puck in the slot in front of the Anaheim Ducks’ net. Neal didn’t waste his earliest opportunity to get the postseason off to a stellar start, and neither did the rest of the Nashville Predators. 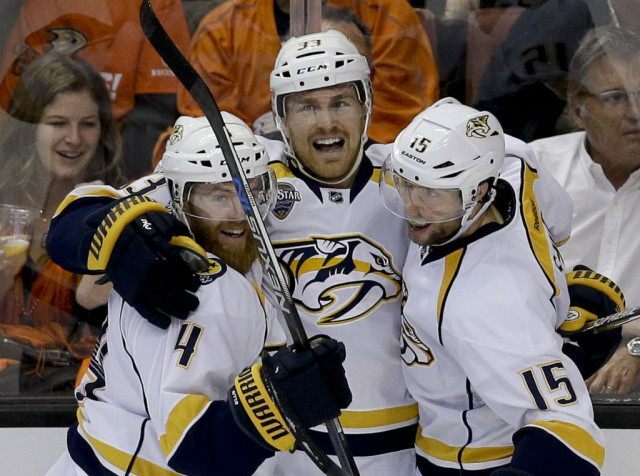 Filip Forsberg got credit for the tiebreaking goal with 9:35 to play, and the Predators opened their first-round series with a 3-2 victory Friday night. Pekka Rinne made 27 saves for the Predators, who knocked off the Pacific Division champion Ducks with a gritty road effort. Five years after Nashville eliminated Anaheim in six games for the franchise’s first playoff series victory, the Predators again took away home-ice advantage from the Ducks in a series opener. Game 2 is Sunday night in Anaheim. After Colin Wilson scored in the second period, Forsberg got the go-ahead goal when his cross-ice pass to Craig Smith hit defenseman Shea Theodore’s skate and trickled past John Gibson. “I thought (Smith) got a stick on it, but it doesn’t really matter,” said Forsberg, who has seven points in seven career playoff games. Forsberg was dangerous all night, and not just with the puck: His open-ice hit on Josh Manson at the first-period buzzer knocked the Anaheim defenseman out of the game. The Ducks declined to provide a postgame prognosis on Manson’s upper-body injury. Captain Ryan Getzlaf and Ryan Kesler scored for the Ducks, who lost an opener for just the second time in seven playoff series under coach Bruce Boudreau. Gibson stopped 30 shots, but Nashville’s speed repeatedly hurt the NHL’s stingiest regular-season defense. Neal tied the Nashville postseason record with nine shots, while defenseman Ryan Ellis had an assist and several big plays. “A couple of mental mistakes ended up in the back of our net, but we expected a tough series from them,” Getzlaf said. Anaheim had a raucous crowd for its first home game since claiming its fourth straight division title. The Ducks rallied from a putrid start to this season and made the playoffs with a dominant run since Christmas. The Ducks have advanced an extra round in the past two postseasons, only to drop a Game 7 at home every year, culminating in last summer’s Western Conference finals loss to Chicago. Now they’ll have to play Game 2 with a series deficit for the first time since their second-round loss to Los Angeles in 2014. Getzlaf scored during a 5-on-3 advantage in the first period, and Kesler put the Ducks ahead 48 seconds into the second with a shot through Jakob Silfverberg’s screen. Wilson evened it later in the period with a remarkable one-handed poke of Ellis’ pass. Manson made his playoff debut for the Ducks, but didn’t return after Forsberg’s hit. Theodore also made his playoff debut on the Ducks’ already short-handed defense in the absence of Kevin Bieksa, who missed his 10th straight game. NOTES: Before the game, the Ducks sent rookie F Nick Ritchie back to San Diego (AHL). He had two goals and two assists in 33 games, getting points in each of Anaheim’s last two regular-season contests after a slow start. … The clubs hadn’t met since Nov. 17 when they finished their regular-season series. … Key forwards Rickard Rakell and David Perron returned to the Ducks’ lineup after heading into the postseason with injuries. Rakell was Anaheim’s fourth-leading scorer, while Perron was a dynamic midseason addition before missing the past 11 games with a shoulder injury.